The importance of effective training for pilots has always been a part of aviation history. From the early days of manned flight, pilots used training tools to simulate the experience of flight from the safety of the ground. Long before the invention of realistic computer simulators or even virtual reality training, flight simulation involved experimental machines tested by trial and error. Here’s a closer look at the development of flight simulation through the years. The onset of World War I amplified the military’s demand for skilled airmen and the training of large numbers of pilots a necessity. Due to limited resources at flying schools, many students received just a few hours of solo flight time and were often unprepared for combat. The resulting accidents and casualties at training units led to the invention of the first synthetic flight training devices. These rudimentary training devices were essentially sections of a wooden barrel mounted and moved manually by an instructor to simulate the effect of a plane in flight. In 1929, a young pilot and flight instructor, Edwin Albert Link invented a flight trainer that replicated a complete cockpit, with controls that could produce the sensations of flying. In an effort to reduce the financial barriers to flight training, Link marketed the “Link Trainer” as an affordable method to become a pilot. Link was soon inundated with requests from the military to create simulators to teach instrument flying, bombing, navigation, and radar operation. Soon Link’s trainers, commonly referred to as the “Blue Box” by student pilots, were standard equipment at flight training schools in the US and Allied countries. Link estimated that his flight simulator was used to train over two million airmen, including 500,000 pilots during World War II. 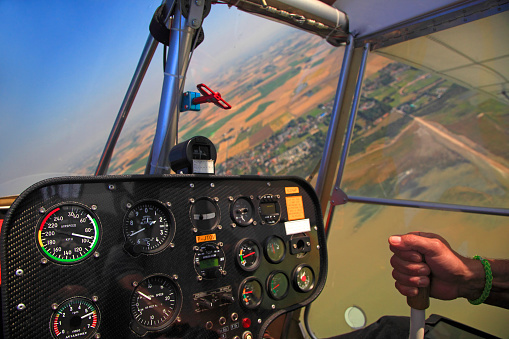 Today’s pilots have many options when it comes to flight training. In the early 1970s, computer graphics were paired with the motion system simulators, enabling pilots to learn the fundamentals of instrument controls while imitating the feeling of flight. Thanks to developments in 3D and virtual reality technology, student pilots can immerse themselves in highly realistic flight simulation training, anytime, anywhere. Check out our friends at Redbird Flight, who are on the cutting edge of pilot training, simulation, and safety.